This airy translation of a favorite candy bar brings sweet joy wherever it's served. Add 1/2 thawed, but cold, coconut. Mix well. Fold in 1 tub COOL WHIP. Pour 1/2 of pudding mixture into the OREO Pie Crust. Drizzle with hard-shell chocolate ice cream topping, if desired. Pour second half of pudding mixture over pie. 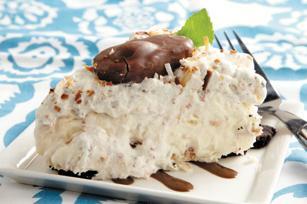 Mix 3/4 cup of toasted coconut with remaining tub of COOL WHIP and spread or pipe on pie. Toast coconut on plate in microwave until evenly browned. Stir often to prevent burning. WATCH CLOSELY. If you wish to use the coconut without toasting, that is also acceptable.